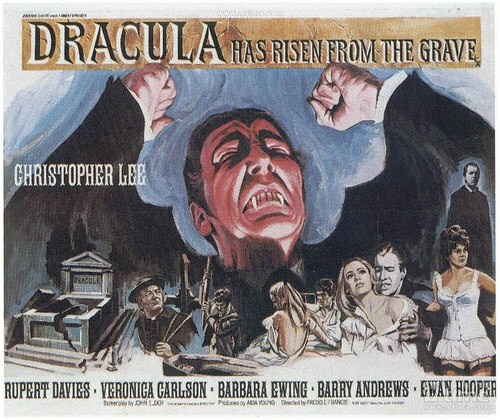 It’s time for another Dracula film. This series has never been particularly good and this one is no exception. Dracula’s a joke and everyone knows it. Even the poster knows this. Look at his facial expression above and tell me that this is a serious villain. He died from falling in a pool of water in the last film! This guy is played for laughs at times and if he is meant to be completely serious then that’s almost sad. Anyway, this film does nothing unique and instead just goes through the motions without doing anything cool or interesting. It’s definitely a very forgettable film and one that will soon blend in with the rest. There’s just nothing to really like here but it is always surreal to see some of the choices that the main characters make. Needless to say they were not prepared for a fight like this. The film starts off with Dracula murdering someone and we then cut to the present where Ernest walks into that town. Everyone is still afraid of Dracula because while he may be dead at the moment, his aura is still enough to corrupt everything that it reaches. It apparently even gets into the Church so everyone just hangs around the bar now. Ernest laughs at them and runs over to Dracula’s castle which he seals with the Cross. Unfortunately, the drunk pastor who had been following him trips and breaks Dracula out of his tomb of ice. Dracula then decides to team up with this guy so they can get revenge on Ernest by getting his nephew, Maria. Will their nefarious plan succeed? Dracula has just never been a good concept for a film. I still stand by that today. The writing is often terrible for these films and they just heavily rely on shock value the entire time. The heroes also never manage to stop him before he bites the main heroine so they’re simply too late. The fact that his victims all crumble into quivering children when faced with his power is also annoying. They’ll just start fainting and running away while in his presence which is not really the kind of thing you want to see from characters who are supposed to have strong wills. The pastor guy was drunk and apparently spineless from the start though so I suppose I shouldn’t use him as a base to judge anything. Still, the characters are really annoying. First off we’ve got our lead Paul. He wants to leave a good impression with Maria’s folks since he is supposedly serious about her, but that doesn’t stop him from passing through the bar and deciding to drink a little. Naturally this doesn’t end well and he messes up the Uncle’s big return by ruining the mood. He decides to sulk by getting even more drunk and allowing himself to be ensnared by the waitress named Zena. He hardly resists her actions and just shrugs it off. Then when Maria actually needs his help he gets one shotted by Dracula several times. He missed with the fire shovel and then runs right into Dracula’s arms. Paul’s a terrible main character and I certainly couldn’t support him during the movie. He makes all of the wrong decisions and doesn’t come off as genuine. How do you lose so many battles in one film? Unfortunately, Maria is just as bad. She gets mind controlled by Dracula and gets thrown into a dungeon by the waitress. The heroes get to her in time before anything drastic occurs and ask her what happened. Her response is to faint multiple times and to explain in the most cryptic and misleading ways possible. She doesn’t mention any of the people who were there, which puts the heroes at a disadvantage. Thanks to her weak mind, Dracula can also enter the house as she opens the windows for him. While not everyone can agree with me that mind control only works on the weak that quickly, we can all agree that she should have at least told everyone what happened the first time. Meanwhile, we’ve got Ernest. He’s probably the only quality character in the film and even then he makes some of the same mistakes as the others. He is betrayed and knocked out to the point of death by the drunk. Later, we see the drunk arrive at his house with Paul (Paul invited him because he’s helpful like that) and instead of warning everyone that the guy is evil, Ernest faints from fright. It’s almost amusing since you Never see the old, experienced tough guy faint in a film like this one. It’s unheard of and also incredibly hard to wrap your head around this. It doesn’t make any sense and it feels like a lazy way for the writers to get Maria kidnapped. Otherwise there’s no way Dracula could have broken in. Zena is the waitress and she’s certainly not a good character. She only exists to flirt with everyone and to get Paul on the wrong path. You know that she is doomed immediately since that always happens to these characters in horror films. Staying in the friend zone is typically the only way you’re safe. Zena didn’t and ultimately ended up paying the price. As for Dracula himself, he’s not really a cool villain at all. He blames all of his failings on Zena and doesn’t even look very good in combat. He shrinks away in fear whenever someone holds some fire or the cross. He trips over his own feet in the climax as he lands in his doom. He even sleeps in a coffin that’s in the basement of a busy bread shop so it’s easy for someone to murder him during the day. It’s almost hard to see why everyone fears him so much when the guy just isn’t very smart. This film is also pretty violent as you would expect from a Hammer production. It really does its best to show blood whenever possible and lots of it. Everyone gushes blood as if we’re back in Bleach whenever they’re stabbed and you can tell that they’re just doing it because they can. The Vampire bites are still as iffy as ever and since the characters take so long so stop Dracula it can barely be counted as a win. The actual body count actually isn’t all that big in this film but the movie makes sure that each one gets enough screen time for two. Overall, Dracula Returns is a pretty terrible film. The writing is lousy and the cast of characters are completely uninspired. There is nobody to root for and that is always a problem if you ask me. You won’t be able to stay invested in the film and the best way to get through it is to take a shot of water every time a character makes the worst move possible. Anything stronger than water and you’ll likely faint so try and stay safe. Still, I’d recommend watching many other films before I’d ever even consider this one. If you have to pick a Dracula film, at least pick the modern one from the new cinematic universe that Universal has been putting together. At least that one tries to stay classy. This entry was posted in Live Action Movie Reviews, Live Action Movies, Reviews and tagged Count Dracula, Dracula, Film Review, Horror, Movie Review, Retro, Review, Sequel, Supernatural, Suspense, Thriller, Vampire by dreager1. Bookmark the permalink.